Catering to the growing population of India, most homes constructed these days are apartments. And while most of our apartments have balconies, they are often forgotten or end up being storage spaces. 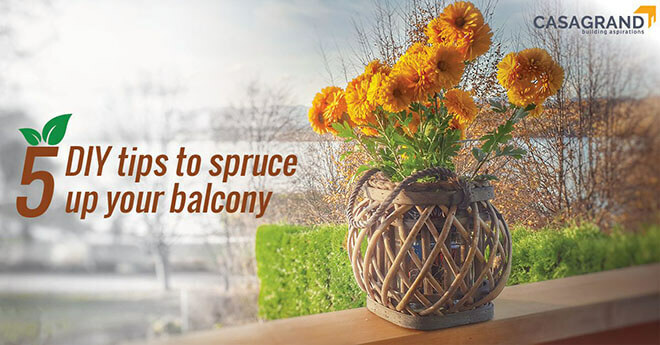 Sprucing up your balcony can give you an exclusive space to unwind after a hectic day at work. You don’t even need to shell out a ton of money. No matter what your balcony’s size is, there are plenty of DIY small balcony ideas to help you spruce it up without breaking the bank. The ideas you could come up with to decorate your balcony are endless. Start with the floor. Balcony floors are typically concrete or will have generic tiles placed that are devoid of any personality. Invest in a generous quantity of AstroTurf or artificial grass to spruce it up. The cost would depend on the size of your balcony and how much area you want to be covered. Another inexpensive option and one of the most common small balcony ideas is interlocking wooden tiles. Go for a faux laminate – they come in a variety of colours, finishes, shapes and sizes and are also less expensive and more durable than real wooden flooring. If you only have a plain concrete floor, try painting it a different colour. You could experiment with neutral shades or a pop of colour to stand out. Here’s a guide to 2018’s top colour trends for your home. If the weather isn’t a problem, go for a carpet or rug instead. A simple carpet or even one with an elaborate design between two chairs or under a small table can immediately brighten and spruce up your balcony. There are also plastic and waterproof carpets available if you experience a lot of rainfall. For everyone living in an apartment, the closest we come to having our own lush, green garden is our terrace or balcony gardens. Depending on the kinds of plants you want and their placement, your balcony could take on different looks. To save space, use hanging planters. Or stack potted plants using a rack or stand. If your balcony is big enough, have separate corners for different plants. Use one corner for palm trees, or place them in every corner for shade and a tropical touch. Ornamental shrubs like bonsai and bamboo can give your garden a Zen feel. Placing a bamboo near a water feature would give your balcony a hint of sophistication. If you don’t have time to take care of your plants, opt for succulents instead. They don’t require water or a lot of attention. Many of them even have colourful flowers. You could also create your own little herb and vegetable garden in one corner. Here are some tips for growing and maintaining a terrace garden. With the right lighting, you can efficiently spruce up your balcony. Using lights in your balcony serve a dual purpose – they are both functional and aesthetically appealing. Place a lamp on a side table or in a corner. Hang lanterns along the railings. A Chinese lantern hanging from the middle of the ceiling would give your balcony an oriental feel. Making use of LED or fairy lights is a lucrative option. They come in several sizes and colours and can be wound around the railing, pots or even draped along the sides and corners. Lights are the most common and delightful small balcony ideas to give your home an instant boost. As a rule of thumb, always look for durable furniture for your balcony. Save the mahogany wood for your living room. There are now multiple furniture companies in India that offer a lot of options for convertible furniture. A movable shelf could be used as a stand for your plants or could even be used as a table for food and drinks. Make use of wooden crates or boxes for a table or to house several tiny potted plants. If you’re looking for chairs, foldable chairs are the best option. They can be removed easily to create more space. Alternatively, you could also have a single hanging lounge chair leaving the entire floor space empty. This is perfect for those looking for small balcony ideas. Just open out the doors and make it an extension of your living room or bedroom. If the floor can fit a single mattress, use one instead of tiles and fill the space with comfortable, colourful cushions and your favourite books. You now have your own personal reading space. At night, use a blanket to get comfy under the stars after a hectic day. It adds a unique and quirky feature to your home. Home is where the heart is and DIY projects are the easiest and most lucrative way of adding your personal touch to your space – and your balcony deserves the same treatment. So regardless if your balcony is tiny or huge, there are endless ideas to make it reflect your style and personality. Whether you’re looking for something minimalistic, colourful or vintage, here are some more DIY tips to upgrade the look and feel of your home. So head out to Casagrand today to find your ideal home.